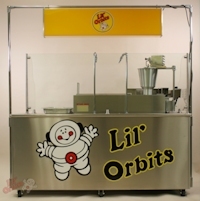 Did you know that Lil' Orbits is a dealer for KitchenAid? We carry the classic Artisan® Series 5 Quart Tilt-Head Stand Mixers, as well as NSF-approved options, and we can get accessories upon request. Ask your salesperson for details! Featuring our AFS-Series Downdraft Filtration System, this package allows you to operate without cooking odors or expensive over-head filtration hoods. Featuring our electric model SS1200 mini donut machine, this portable "Donut Factory" is our most popular package. Featuring our NEW SS1200-GII machine, this package gives you the freedom to operate in remote locations -- without electrical hookups. Featuring our NEW SS2400-GII, the high-production version of our ultra portable gas-fired line of machines. Featuring the electric SS2400 machine, this package is our top money-maker for high traffic locations. Whether starting a brand new location or adding donuts to an existing one, this package can easily be incorporated in the center aisle of a mall, convention center, airport concourse, arena, etc. 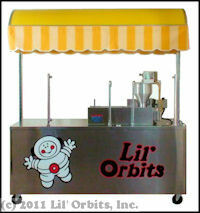 The perfect starter package for adding mini donuts to your concession trailer or existing foodservice business. Complete starter package for our innovative Uni-Matic II pancake & crepe machine. The perfect starter package for small fund raisers or weekend events. Add variety to your operation by serving a dozen donuts nacho-style with a scoop of icing.